French television in Q & A format. Question: the French media seems to be experiencing a crisis of sorts. What are the factors? Answer: The short answer is it's very cold out there in the French media, which pushes consumers away. Work environments have become hypercompetitive over the years to the point the French media reflects the hypercompetitive nature of the game. The media is competitive everywhere, but elsewheere you usually see journalists or show hosts showing a friendly and warm face on the air before retreating to colder personalities. 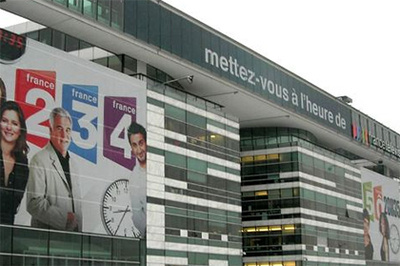 In France, different personalities are literally competing on the air. This has several repercussions. Hosts or Masters of Ceremonies are glorified in France because they get to say the final word. Their books are automatic best sellers and they tend to keep their jobs for decades, again, because they get to say the final word and they get to keep being on air to respond to critics. Critics or columnists are also glorified because they get a lot of air time, and their books are automatic best sellers as well. To give you an idea of how fierce the competition is, you see several instances of conservative pundits shooting down teenage pop music stars. I mean how does a 50 something pundit get to tell a music star whose audience is teenagers that his or her music lacks taste. Now to put things in perspective you need to understand what kind of education environment the French grow up in. You have the teacher, the master of thinking or maître à penser, who does most of the talking in class. The only time a French student really gets to tell his opinion is in foreign language classes where there is something of an opinion essay at tests. Among students, competition tends to be fierce because those with the highest grades get automatic access to elite universities. Same goes for the media. Those journalists with the higher readership get to be hosts or famous pundits at some point. So they get shot down before they become anyone famous. It's no surprise that most famous hosts and pundits have families who are either in the media or in the government, either in the form of a spouse or a parent. Others are thrown out before they get to taste fame. And because this is France, no journalist is just trying to do his or her job, pretty much everyone wants his or her shot at fame. Question: there seem to be a lot fewer recognizable faces in the French media than in the past. What is going on? Answer: people in the 60s, 70s or even 80s were a bit more naive and did not have the tendency to shoot down those who made their attempt at fame. So you had a lot of journalists who were also novelists or essayists or both. The press corps were more flexible, allowed journalists to work on their private projects. Newspapers, television, the radio also had a lot more people tuning in back then. Yes there were fewer television stations and radio stations, but there were more newspapers and magazines so to speak, especially regional ones. In the 1990s, the media became a lot more thematic. Prime time television in the 1980s and 1990s celebrated guests and hosts so much that ordinary French people who had to face the rigors of a 9 to 6 job did not understand how seemingly normal people could be celebrated with so much pomp and fanfare. Now the generation of people who were famous hosts, pundits or public intellectuals is retiring, either because of age or because they no longer recognize the competitive nature of the media. Best selling books tend to be books criticizing other best selling authors, and the competition extends to the book market where pundits write books criticizing other pundits. Final question: Racism, anti-Semitism, other extreme ideas seem prevalent in the French media. How do you explain that? Answer: Again it's the competitive nature of the media. You can criticize other people's ideas, and failing that, question their ethnic backgrounds or political affiliations. It's really about intellectuals racing to the top and destroying everything they can in the process. A lot of times the criticism is done in shabby and sketchy ways. Let's take a famous example. Comedian Dieudonné was heavily criticized for making what appeared to be an anti-Semitic stand up skit. What people tend not to mention was that he was visibly drunk during the skit, that he had visibly not carefully prepared his skit, that he had made previous anti-Semitic skits (at least in my opinion) including calling the Bible “toilet paper” and that he had written an entire book “of insults to people who had sent him letters of insults.” Who does that? All this was not mentioned, he became the symbol of free speech or lack thereof, and of course, in the free speech debate, few people mentioned the hypercompetitive naature of the media. Of course I disagreed with the character assasination campaign against the comedian which lasted for over 10 years, but that's the competitive nature of the French media.